I think I was around ten or eleven when my best friend, without asking if it was okay with my parents, bought be a zebra finch and cage for my birthday. I got him a wife, and they had some chicks – managed to raise two to adults. Eventually they died, and I got a budgie, had him for a few years, and got a cockatiel. I lost the cockatiel (she was a sweetie too), and got a lovebird. Kept birds until I was nineteen, and moved to Australia, and couldn’t take the lovebird with me. She was easy to get rid of, tame as hell, because I hand raised her from a few weeks old, and the first person to come see her fell in love with her when I went to give her away. I’ve always loved birds, and been fascinated with anything that can fly. I would watch the finches for hours as they flitted back and forth across their cage. But the reason I stopped keeping birds, ultimately, was because once I got to the parrots – the ones that make the best companion pets, (important because I was such a lonely child) you have to clip their wings if they’re going to be out of their cages for any significant amount of time. A thing with wings should fly. I dreamed of doing something like falconry, where one works with birds unclipped, letting them fly. I remember a group bringing in a bunch of rescued raptors in a show, and getting to see a great grey owl in person, that they had fly over our heads in the multipurpose room at school. I remember being captivated by David Bowie’s Goblin King, because the Goblin King could shape-shift into an owl. My favourite Cosgrove books were Shimmeree and the Flutterby ones, because they were horses with wings. I read the Pern novels just for the parts where characters get to ride on the backs of dragons. I’ve been using this program a couple of years and managed to hook a couple of writer friends on it too. I’ve been using it long enough and like it enough, that at this point I would be terribly annoyed to have to do without it. Pros: I love how it gives me the ability to organize my work to the extent that it does. 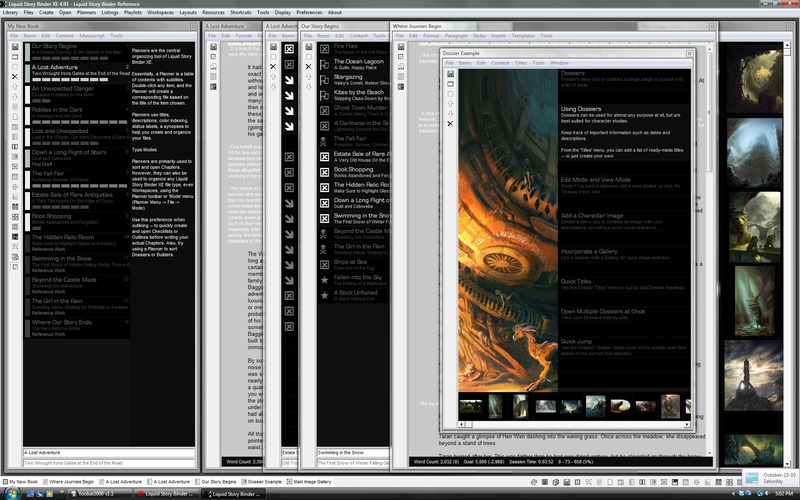 It makes it easy to reorganize scenes, and have multiple windows open in front of me at a time. Cons: The program has a bit of a learning curve – things aren’t in really intuitive places, and there’s so many things it can do, it’s hard to get as much out of it as you can right away. I can deal with that though. And second, there are issues with exporting documents. If I export it the wrong way, I lose formatting. Or I get an error when I’m trying to convert it into an e-pub. Or it creates a document that’s the entire thing written on top of itself on the first line, in pale grey coloured font. Or it strips all the quotation marks out. That last one’s the most annoying – I don’t always notice it right away. And it’s hard to remember which way to do it, for which purpose. I’ve hit the point where it’s just safer to build the manuscript, and then copy and paste from there rather than actually exporting it. I’ve loved this program a long time, but I’m sad to say that now, with a finished manuscript, the exporting issues are annoying enough to make me start seriously thinking of looking for an alternative. As much as I’d prefer not to give apple more money than it needs, I’m considering trying out scrivener, at least for the trial period.